If you're looking for a creative party favor that can blend in with any theme, look no further than glass jars. Most people overlook them, but they're a simple way to add a festive touch to your next party! Whether you're hosting a country-themed party or a dinner party in your garden, having everyone drink out of a mason jars is much more fun than putting regular ol' glasses on the table. Best of all, you can add cute lids, straws, or even personalized stickers to make each mason jar stand out even more. Not only will your guests have fun sipping on their drinks, but they'll also have a cute jar to take home! It's easy (and affordable!) 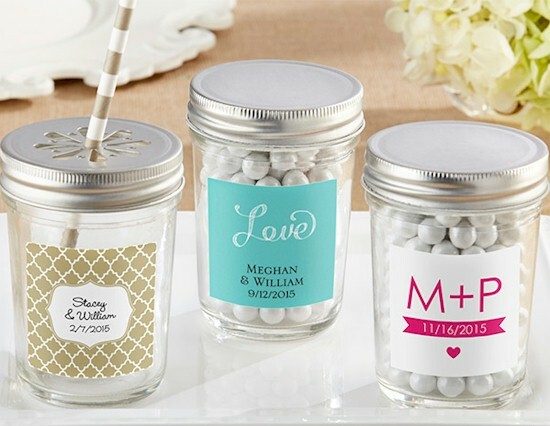 to get stickers for your glass jar party favors that have your name on them, a special color, or a cute drawing that matches your party's theme. But if you really want to make things unique, opts for personalized mason jars that come with special charms or stickers that you can write on. We love the ones that come in mini chalkboard form because you can use them over and over again. You can use a piece of chalk to write each person's name and use the jar as a placeholder, and then your guests can wipe the label clean and write whatever they want once they get home! It's easy to turn glass jars into TWO party favors in one. All you have to do is fill each jar with something fun -- like candy, a take-home dessert, or even some wax that turns the jar into a cute candle. None of this is hard to do, but your guests will really love it!